The waiting time is finally over! Tomorrow the Tour de France starts with the only individual time trial of the entire three-week race and even though only 13.8 flat kilometres in the city of Utrecht are on the menu, it is the most important day of the entire season for at least two riders. While the GC contenders hope to get the race off to a solid start and gain a few seconds before they go into a dangerous first week, Tony Martin and Tom Dumoulin have been aiming for yellow jersey ever since the Grand Depart in Utrecht was announced while Fabian Cancellara hopes to continue his impressive streak of success in opening time trials at the Tour de France. While Jean-Marie Leblanc was still in charge of the Tour de France, the race usually had a lot more time trialling than it has done in recent years, and the event always kicked off with a time trial. When Christian Prudhomme took over the responsibility, he not only reduced the number of TT kilometres, he also deviated from the pattern of hosting a race against the clock on the opening day. In 2008 the race opened with a traditional road stage for the first time in several years, with Alejandro Valverde winning an uphill sprint in Plumelec. In 2011, the time triallists again missed the chance to go for glory on the opening day when another uphill sprint on the Mont des Alouettes saw Philippe Gilbert take the first yellow jersey of the race. Since the bonus seconds were skipped in 2008, the sprinters have had no chance to overcome their early deficits to ride into yellow, and until 2013 the last bunch kick expert to wear the coveted leader's jersey was Tom Boonen in 2006 (if you omit Thor Hushovd's stint in yellow in 2011 which was not due to his ability as a sprinter). In 2013, Prudhomme not only kicked off the race with a road stage. As it was completely flat, he gave the sprinters what at the time seemed to be a once-in-a-lifetime opportunity to take yellow on the opening day of the race. Marcel Kittel made the most of it when he won a very confusing opening sprint that saw riders like Mark Cavendish, André Greipel and Peter Sagan being held up by crashes. Last year the sprinters again had the first shot at the yellow jersey and in a dramatic uphill sprint in Harrogate it was Kittel who made it two in a row. This year Prudhomme has returned to the traditional formula with an opening time trial and for the first time since 2012 it will be an individual effort that decides the first holder of the yellow jersey. Back then, Fabian Cancellara powered around the course to win the prologue in Rotterdam on a dramatic day when Tony Martin suffered a mechanical at a time when he was in a good position to win the stage. In fact, Cancellara is unbeaten in an opening Tour de France time trial since Thor Hushovd took the win in 2006. For the second year in a row, the race will have a start abroad and that has only happened once before, in 2009 and 2010 when the race started in Monaco and Rotterdam respectively. This year it is the city of Utrecht that will welcome the Tour and it marks the second Dutch Grand Depart in just 6 years. The Dutchmen seem to have a preference for opening time trials and this year they have designed a 13.8km course in the centre of Utrecht. In fact, it is the longest opening time trial since 2009 and it is rare for a first-day TT to be longer than 10km. The course is completely flat, with the riders staying between 3m and 5m above sea level, and it is a not too technica. At least 15 turns and two roundabouts will challenge the riders over the short distance but most of them are soft and won’t require too much braking. They come throughout the entire stage, with the first half being slightly less technical that the second part. The final left-hand turn comes just 370m from the line after the riders have turned right just before the flamme rouge. Utrecht last hosted the finish of a grand tour stage in 2010 when Tyler Farrar beat Matthew Goss and Fabio Sabatini in a bunch sprint on stage 2 while Cadel Evans took over the maglia rosa after prologue winner Bradley Wiggins had missed a split in the finale. Most of Europe is suffering under a heat wave which will have a massive impact on the first days of the Tour de France. The last few days have already been very hot but Saturday is expected to be the climax. There will be quite a few clouds on the sky but with a maximum temperature of 33 degrees, it is unusually hot conditions for the Netherlands. Importantly, there is a 25% risk of rain in the evening but it is unlikely to have set in when Vincenzo Nibali roll down the ramp as the final rider at 17.17. There will be a moderate wind which will actually slightly change direction during the stage. While it will come from a southerly direction for the early starters, most of them will face a westerly wind but it shouldn’t make much of a difference as the riders will start and finish are located close to each other. Most of the riders will mainly have a tailwind in the first part and a headwind in the second part. Only one cycling event can create the pre-race hype that we have experienced during the past weeks. Most of the best riders in the world have gathered in Utrecht where the cycling-mad Dutch public has welcomed them with a warm reception. While the riders have spent the last few days checking out some of the opening stages, most have been talking about the opening time trial. At the end of a three-week grand tour, 13.8km on flat roads in Utrecht are unlikely to play much of a role but the first stage of the Tour always gets special attention. It is the only stage of the entire race that has a guaranteed double bonus of a stage win and a yellow jersey and the outcome of the stage will have a huge impact on the racing over the next few days. For the first time since 2012, the GC riders will even have something to win and it will not all be about staying safe in a sprint stage. The time gaps won’t be massive but it will be important to get the race off to a good start from a psychological point of view. Furthermore, car position will be very important in the first week, especially in stage four on the cobbles, and so it will be important to have a rider high in the overall standings right from the beginning. With the limited amount of time trialling, the GC riders have mostly been focused on their climbing skills in the build-up for the Tour. However, others have had a completely different approach. Ever since this stage was announced, Tony Martin and Tom Dumoulin have made this stage their biggest goal of the season and they have meticulously prepared for those 13.8km. In fact, none of them have probably looked much at what the rest of the three-week race holds as they have been extremely focused on the opening day. After he missed out on the lead in the opening time trials in 2010 and 2012, Martin will get a unique chance to finally get his first stint in yellow while Dumoulin would love to wear the maillot jaune in his home country. The course is a mixed affair. On one hand it is pretty short which clearly favours the prologue specialists more than the big engines. However, it is still much longer than a prologue and it is probably too long for the sprinters to be close to the best. Furthermore, it is not technical enough to suit the fast riders who usually need several corners to benefit from their acceleration and good bike-handling skills. Looking at the map, there are evidently a lot of turns but most of them are soft and there should be plenty of room for the specialists to power along in the straight sections without having to slow too much down along the way. Martin has already had a look at the route and he was pleased with the easy nature of the technical challenges. However, much will depend on the position of the barriers as they could make the turns narrower and the course more technical. The riders won’t get to know about that before they do their only recon rides on closed roads tomorrow morning. However, it should be a course more for time trial specialists than prologue riders and sprinters. The wind is set to change a bit during the day but as said it is unlikely to have much of an impact. The real danger is the rain but luckily it seems that it will only set in after the stage has finished. However, pre-race favourites like Rohan Dennis, Tom Dumoulin and Tony Martin have opted not to start in the final wave of riders, probably to avoid any unnecessary risks. On the other hand, most of the GC riders have opted for a late start, meaning that they have deemed the risk almost non-existent. With the course being pretty non-technical, it is hard to look beyond Tony Martin as the favourite. The German has clearly been the best time triallist on flat courses for most of the past five years, with only Bradley Wiggins having been able to challenge his supremacy on certain occasions. However, while he has dominated the longer time trials, Martin has had little success in prologues that are usually too technical and too short to suit his powerful style. If this had been a 50km time trial, he would have been the overwhelming favourite but over this distance, it will be a lot closer. However, Martin has still been strong in TTs of this race, mostly in the Tour of Belgium which he has won three years in a row. Last year he beat Dumoulin in a 16.7km time trial in that race on a course that was not too different from this one. Furthermore, he has twice won the Tour de Romandie TT which has often been of a similar distance, albeit often a bit hillier. Martin has had mixed results in time trials this year but that’s no surprise. The time trials in Paris-Nice and Vuelta al Pais Vasco were way too hard for him but he still did decent performances. In Romandie, he narrowly beat Ilnur Zakarin – who was set back by a mechanical – on a hilly, technical course that didn’t really suit him and in February he beat an in-form Adriano Malori on a flat course in Algarve – albeit by less than a second. Martin has meticulously prepared for this race and he showed good condition in the German TT championships and at the Dauphiné. In the last few years, he has been one step above key rivals Dumoulin and Fabian Cancellara. He hasn’t been up against Dumoulin in a flat time trial in 2015 and there is a chance that the Dutchman has closed some of the gap. However, based on previous results, Martin is the man to beat. Fabian Cancellara has flown a bit under the radar as he has been suffering from the effects from his crash in E3 Harelbeke and only returned to racing in the Tour des Fjords one month ago. In that race he was far off the pace and things only got worse when he got ill before the start of the Tour de Suisse. In that race, he was still far from his best but it is testament to his incredible TT talent that he still came away with good results in the two individual tests. He was just seconds from winning the prologue two days after having recovered from illness and in the hilly final time trial, Dumoulin only managed to beat him by 19 seconds. Cancellara is clearly not the time triallist he once was but he remains one of the best in the business. In fact, he beat an unstoppable Adriano Malori in Tirreno-Adriatico and the likes of Martin, Wiggins and Dumoulin in the same race last year. In the 2013 Vuelta, he even beat Martin in the Vuelta TT before going on to having a close fight with Wiggins for silver at the Worlds. In general, people seem to overestimate the decline in his TT performances and we won’t be surprised if he continues his winning streak at opening time trials that has seen him win every such stage since 2007. He claims to have good sensations and the relatively short distance suits him. In a 50km race, he would find it hard to beat Martin but over this distance he will be much closer. He is still the best prologue rider in the world and if the course had been more technical, he would have been our favourite. All Dutchmen cross their fingers for Tom Dumoulin who gets an once-in-a-lifetime opportunity to wear yellow on home soil. During the 2014, he proved that he has firmly established himself as the best of the best behind Martin, Wiggins and Cancellara and he finished second behind Martin on several occasions, including in the long time trial at the Tour, before taking bronze behind Wiggins and Martin at the Worlds. This year he has been unstoppable in the time trials. He was ill in Paris-Nice but surprised most by winning the Vuelta al Pais Vasco TT which included several very steep climbs and was more for climbers than specialists. In Switzerland, he won both TTs to confirm his status as a favourite for this stage. Surprisingly, he could only manage fourth at his national championships. At first he said that he had not recovered from the Tour de Suisse but it has since come out that he was a bit ill. He refuses to use it as an excuse and claims to be 100% fit for tomorrow. However, that small setback could make the difference in this close competition. He has not been up against Martin in a TT this year except from the one in Pais Vasco which was too hard for the big German. Hence, we don’t know if he has closed a bit of the gap. The shorter course should be in favour of Dumoulin but it may still be a bit too long for him to beat the pre-race favourite. Rohan Dennis has flown a bit under the radar but it would be no surprise if the Australian is close to the win. Like Dumoulin, he is constantly getting closer to the best. Last year he was second in almost every time trial he did and had an amazing ride to finish to take third in the final stage of the Vuelta despite doing the final part on the flat, technical course under the rain. Without that bad luck, he would undoubtedly have won the stage. This year he has confirmed his progress, most notably with a second place in the Paris-Nice prologue. However, it was his performance in the Dauphiné that really showed that he is back at the top of his game after a mid-season slump in form. He was the key driving force behind BMC’s win in the team time trial and there is no doubt that he is ready for his second Tour de France. The relatively short distance should suit him well. He has opted for an early start and is likely to spend most of the day in the hot seat. Adriano Malori is widely regarded as the final ride in the time trial top 5 behind Martin, Wiggins, Cancellara and Dumoulin. The Italian managed to beat all of them in last year’s Tirreno time trial and this year he was less than a second from beating Martin in Algarve. When it comes to pure power on long straights, Malori is very hard to beat. He suffers a bit over the longer distances but on 10-20km time trials, he is very strong. This flat course should suit him well and he will benefit from the fact that it is not too technical. He would have preferred even fewer turns and there may still be a bit too much braking for him to realistically challenge for the win. However, he beat Cancellara in a technical prologue in Tirreno so it won’t be impossible for him to make a similar performance in Utrecht. The only GC rider who can realistically aim for the win is Chris Froome. When he is at 100%, the Brit is a formidable time triallist who famously finished a close second behind Martin in the flat time trial at the 2013 Tour de France. However, it seems that he has lost the edge in the TTs and since he crashed out of the 2014 Tour he has not done a single good time trial. Furthermore, he has probably focused mostly on climbing for this race which has very little time trialling. Finally, the course is too short to suit him well. On the other hand, Froome is always flying at the start of a grand tour and it would be no surprise if he fires a strong warning shot already on the opening day. We have very mixed feelings about Michal Kwiatkowski’s chances. On one hand, the Pole is an excellent time triallist on short, flat courses – just recall how he beat Dennis and Martin in the Paris-Nice prologue. On the other hand, he has been riding very poorly in the past few weeks. He was surprisingly far off the pace in the Tour de Suisse but at the time he claimed that to be a deliberate choice. However, his poor showing in the Polish national championships were harder to explain and he admits that he hasn’t been feeling good. On the other hand, he still claims to be feeling better than he did last year and even though he wasn’t remarkable in the 2014 Tour, he still did a solid first week. He would have preferred a more technical course though and it will be hard for him to win the stage. 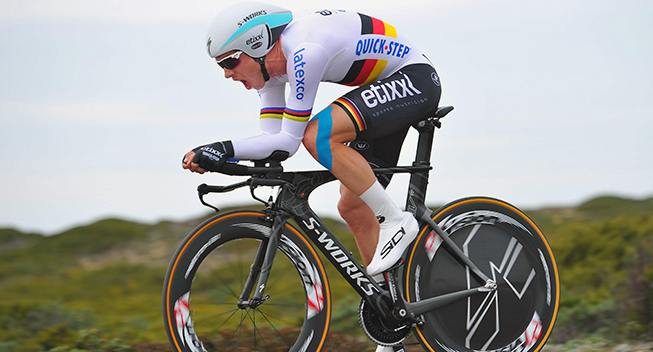 With an opening time trial being an exception, the time triallists have all made the opening stage one of their biggest goals for the year and specialists like Tony Martin and Tom Dumoulin have specifically prepared for the event. The former is still desperately chasing a first stint in yellow while the latter would love to wear the leader’s jersey in his home country. However, they will be up against Fabian Cancellara who is one of the best time triallists on short, technical courses and Adriano Malori has also made this stage a big goal. For the GC riders, it will be an important day as well as solid gaps can be made over this distance and Chris Froome will be keen to gain as many seconds as possible in what will be the only ITT of the race. The sprinters usually do well in prologues and will be keen to stay within striking distance of the yellow jersey. They will find the technical nature of the course to their liking but the distance is probably a bit too much for them to realistically aim for yellow in stage 2. In addition to Malori, Movistar have two good cards to play. Jonathan Castroviejo had a slump in TT form in 2014 but returned to his best in time for the Worlds. This year he has continued his upwards trend by delivering several strong performances, finishing third in the flat Tirreno-Adriatico TT. He has often done well on short, flat courses even though he may have lost a bit of power due to his weight loss. He recently took a dominant win in the Spanish TT championships. His teammate Alex Dowsett is another strong candidate but in the last few years he has had a hard time living up to the lofty promises he showed in 2013. However, he seems to have become stronger after doing the Hour Record and should find the flat course to his liking. IAM have no less than four riders who could do well on this course. Matthias Brändle has been very strong in the short, flat time trials he has done this year, finishing third in the Tour de Suisse prologue and winning in the Tour of Belgium. This course may be a bit too long to suit him well though. The distance is perfect for Sylvain Chavanel who has been very strong in time trials in the last few years. However, he didn’t show his best condition at the French championships. Jerome Coppel beat in that race. He has done very good prologues in the past and seems to be in excellent condition. Finally, Stef Clement has returned to his best in 2015 but this course may be too short and flat to suit him. Bora-Argon 18 hope to get the race off to a great start with Jan Barta who was third in the long time trial at last year’s Tour. He would probably have preferred a longer distance but he should be able to do well here too. On the other hand, he has been time trialling very well this year and he only managed to beat Sagan by a few seconds in a much longer time trial at the Czech-Slovakian national championships. Sky will be mostly focused on Froome but Richie Porte and Geraint Thomas are both aiming for strong rides too. Thomas was once a great prologue rider but he has lost a bit of power due to weight loss. Furthermore, he wasn’t very good in the Tour de Suisse prologue and would probably need a longer, harder course to really shine. The same goes for Porte but both should still be among the best. Peter Sagan is one of the big jokers for this stage. The Slovakian has clearly returned to his best after a slow start to the year and he has been time trialling amazingly well. He crushed the opposition in the Tour of California on a flat course of a similar distance. However, that stage was a lot more technical and this one is probably a bit too long and easy to make him a real contender. Wilco Kelderman and Bob Jungels are both newly-crowned national champions and clearly in very good condition. The latter has done some very good prologues in the past and will be full of confidence after he beat Dumoulin a few days ago. Jungels has also done solid prologues in the past but nowadays he seems to need a hillier course to really shine. Lars Boom is another local hero who could do well. However, the Dutchman is not the time triallist he once was and even though he has improved a bit, it will be hard for him to finish in the top 5. His teammate Lieuwe Westra would once have been one of the favourites for this stage but he has clearly lost his abilities in what was once in preferred discipline. He has barely finished in the top 20 in a time trial in the last few years. Michael Matthews, Nelson Oliveira, Andriy Grivko, Daniele Bennati, Greg Van Avermaet, Daniel Oss, Thomas De Gendt, Tiago Machado, Luke Durbridge, Svein Tuft, Jos van Emden, Markel Irizar, Sebastian Langeveld and Ramunas Navardauskas can all aim for strong rides but it will be a surprise if they are in the top 10. Among the GC riders, Alberto Contador, Andrew Talansky, Tejay van Garderen, Alejandro Valverde and Vincenzo Nibali should do well but they would need a longer, harder course to be in contention for the top positions.